Here’s the panel on the car. 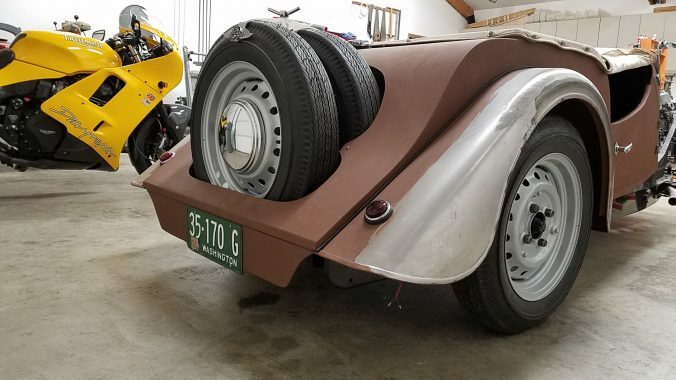 There should be a piece of rubber beading above it, which is contiguous from both rear fenders. When I do the final beading, I’ll add it. The panel should also be flush with the edge of the rear center panel, but I didn’t care for the look, so recessed it a bit. Rusty Heaps is the ongoing documentation of Roger Los' possibly boring and definitely financially crippling car hobby. It's unclear if this website is just one big HIPPA voilation or not, given that he considers the whole thing "therapy". Always interested in hearing about whatever British car you have, and if you need to find it a new home, you can always try me first. Email ruin@rustyheaps.com...note, I am perhaps the laziest correspondent in the world, so it may take a bit to get back to you. Jaguar Mk. V or Riley RMB?